I've read through every key thread that I can get my hands on and I still have a question. Is the mechanism for reading the transponder in the key the same mechanism which recharges the battery in the key? I'm fairly certain that my wife's car is no longer charging keys and I would like to fix it. Similarly, while the key is in the ignition with the car running, they battery in the key is recharged via inductive coupling (like a cordless rechargeable toothbrush). Is it possible to have one of these functions work and not the other? I have 3 keys. The 2 original full access diamond remote keys and 1 additional full access diamond remote key ordered from the dealer roughly a year ago. The Valet Key and I *think* maybe a plastic key were lost years ago in a move. Pretty much only 1 key was ever used. The 'spare' key was put away with other spare keys in-case of emergency and likely never used a single day in its lifetime. So, when the remote in the 'daily' key quit working the spare was dead too. But of course both keys worked perfectly fine manually in the locks and to start the car. Basically both of the original keys had reached their end of life on the remote batteries (so I assumed) so I simply ordered a new one. Now, the 'new' key from a year ago has quit working to remotely lock/unlock. The fuel door properly locks/unlocks when any of the keys are used manually in the driver's door. Could something be misaligned with lock/ring antenna such that the keys start the car but not charge the keys? I've monitored the keys with a spectrum analyzer and I'm not getting any RF out of all 3. So since the remote buttons are apparently doing nothing, I have not attempted to re-pair the keys. The charging circuit for the key battery is completely separate from the RFID transponder pill stored in the key. This is why the valet keys work for ignition, yet they contain no battery or standard RF transmitter for lock functions. It's also why some people buy the valet or wallet keys for cheap, an ebay key for cheap, and install the coded RFID pill into the ebay key. That's a lot of work though, and it ends up being about the same cost as just buying it from a dealer because the key blank must still be cut by a locksmith. I paid $120 at BMW of Peabody, MA with my CCA discount a few months ago. My last car, an e46 2000 328i had a diamond key too which started to have range trouble until it finally quit. As a stop-gap measure before I installed a new rechargeable battery I would put the keychain on top of my toothbrush charger at night. Kind of weird, but it worked. The key does charge by inductive coupling but my guess is that the car stopped charging the key in the same way that many standard battery chargers will not recognize a completely flat battery. The OralB toothbrush charger though just emits a field regardless of whether something needs charging. This let me have a fully charged key all day that worked like new. I believe the key remote frequency is 315Mhz, does your spectrum analyzer have sufficient bandwidth and an antenna to receive this frequency? To make things easier, most auto parts stores have car remote battery testers at the counter that will illuminate a light when they see a signal. Those work well to check our keys. Do you know where in the steering column the 'charger' is located? I don't see anything obvious on realoem.com. Yes, I'm certain I would have been able to detect any RF coming from the remote portion of the key. Since the odds that all 3 buttons on the key have become non-operational, that's part of my conclusion that the battery is dead even though its nearly brand new. The charger is a ring around the keyhole. I'm not sure which part it is, but it's just outside of the traditional lock cylinder. Which somewhat circles back to my question. The ring antenna on the outside of the physical lock mechanism. Is this antenna used exclusively for charging? exclusively for activating/reading the transponder in the key? or both? The ring coil/antenna does both. See page 24 of the attached PDF. Isn't this question answered in the PDF (BMW's training document) found in post #6? • New appearance with blue and white BMW roundel. • Rechargeable battery replaces replaceable batteries. Charged by EWS ring antenna. • The key housing is encapsulated and can not be opened. • The LED has been omitted. • Key will be used in E46, E38 and E39 vehicles. Thanks for the pdf rdl. I'm beginning to think that the ring antenna is either misaligned or isn't producing a strong enough field to charge a key. Another interesting tidbit from that doc..., "Low transmitter battery fault code storage in the GM." Page 26 states, "As with previous systems, every press of an FZV key also provides the battery charge condition. When the FZV electronics receives a low power condition message three successive times, the GM sets a fault indicating a low battery within a specific key. The LCM is also informed via the bus system and alerts the driver via an instrument cluster matrix message." The PDF is an X5 training document. For instance, the alarm system description is clearly X5 specific although the design concept is shared with the E39. So I wouldn't rely on every detail being present in an E39. 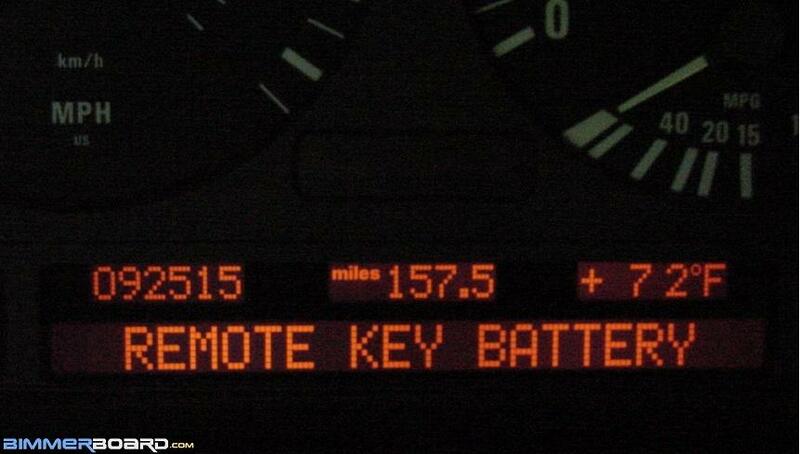 I've never seen any mention of a state of charge warning for the key battery in the E39. There is no mention of it in the E39 owner's manual. I learned another piece of the puzzle last night - the car is no longer auto-locking when it gets up to speed. Somin's not right. I got my car with two factory dead keys. Got a new key from the dealer, been working great since. 50'+ range. I drive it 40 min/day and do a lot of 10-15hr trips. Usually about 2 or 3 per month. Key is perfect. I'd say you probably need a new key. That's the most common failure, the battery inside dies off. Dealer even told me if you get more than 5yrs from a key you are lucky. DD: 2003 530i 5spd manual sport package. Conti DWS's, Llumar ATR, White LED lighting. TLC on-going. Garage queen: '07 335i Sedan, base pkg, 6spd Manual, Procede 3 V5 w/NLS, staggered 18" 313's w/Conti DWS's, OS Giken TCD LSD, VAC Street Diff Cover, Akebono Euro Pads, CDV Removed, Black BMW Grilles, Interior & Exterior white LED lighting, LUX Angel Eyes, Debadged, Llumar ATR Tint. +1 The batteries are the primary thing that fails over time. There are a couple of locksmiths in the UK that repair these keys for a very reasonable fee. They advertise on Ebay. There is one other important aspect that no one above has mentioned. The diamond shaped keys for 2000 and later cars do not have separate 'pill' type rfid transponders. The EWS transponder on these keys is part of the circuit board assembly. The batteries on these diamond shaped keys are also not really batteries. They are capacitors that can hold a charge for a long time but they do eventually fail to hold a charge. I intend to send one of my old keys that has failed to one of the guys on Ebay in the UK for repair. 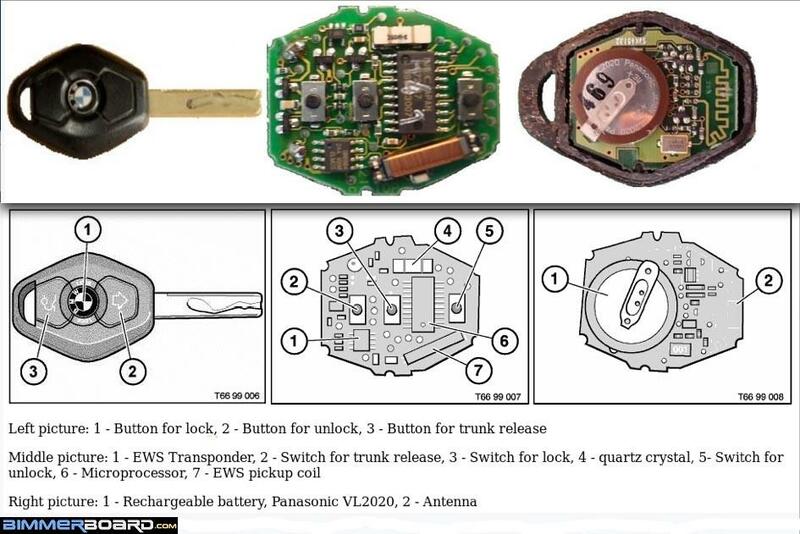 I can say that the failed key will not operate the locks wirelessly but it does open the doors and will start the car so the battery (capacitor) is not powering the rfid transponder. The battery in a diamond style key is not a capacitor but a lithium battery. Capacitors of sufficient size to be able to support the key operation typically have a relatively high self discharge rate and are not appropriate for storage. The only common application I know of for capacitors in place of batteries is in a Citizen Eco-Drive watch. This is quite different as the cell is only asked to power stepper motors and the charge level is typically maintained by sunlight. A sleep mode activates if the watch stops charging for more than a minute and the second hand stops. The diamond key batteries are rechargeable lithium ion and look very similar in appearance to a CR2032 but with tabs. I replaced one in my old e46, same key style. As I mentioned before, the battery is in no way connected to the RFID 'pill'. The RFID chip receives power from the ignition transponder system wirelessly as needed. The chip is not boosted to extend range because that feature is not needed. For once they have not made things overly complicated. Lithium ion batteries, just like the ones in a cell phone or laptop have a finite number of charge cycles before failure. The number is quoted as full discharge cycles so if you discharge the battery to 50% twice it only counts as a single cycle. Most people do not know this it seems and think that a cycle is any time you interrupt charging. The batteries in our keys last quite a while because the battery never discharges very far (unless you give your key to a toddler to play with). Each time you drive your car it gets topped up. Ditto everything you said about the new style key. For the record, I just made a composite photo of the stock battery (90° offset) and the typical replacement (180° offset). Please read the suggested threads and add value, either by pictures or by descriptions, so the next person stands on your shoulders. Last edited by bluebee; 02-26-2013 at 07:54 AM.